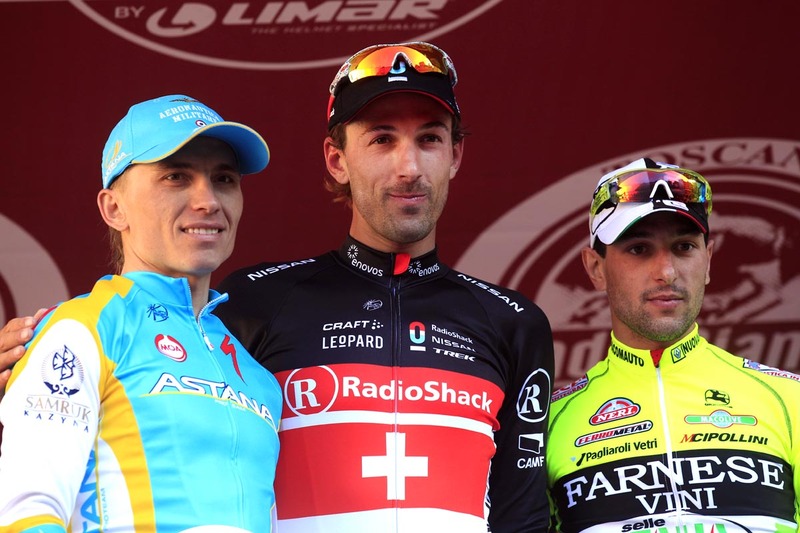 Fabian Cancellara conquered the Tuscan gravel roads and won the Strade Bianche on Saturday in Siena’s Piazza del Campo. The Swiss Champion of RadioShack-Nissan attacked solo on the last gravel sector and rode solo into the Campo with a minute’s lead. Race organiser RCS could not have asked for a more ideal winner, a true classics champion. Besides the second edition of Strade Bianche in 2008, Cancellara won Paris-Roubaix, Tour of Flanders and Milan-San Remo – three of cycling’s five monuments. Maxim Iglinsky (Astana), Oscar Gatto (Farnese Vini) and Alessandro Ballan (BMC Racing), in order, fought for the leftovers. Ballan’s team-mate, Greg Van Avermaet finished in fifth. His win came after a 10th overall in the Tour of Oman and gave his newly merged team its first of the season. It came thanks to a move on eighth sector of the day, appropriate for a race marked by the white gravel roads south of Siena. Eight sectors, or 57.2 kilometres, of gravel roads coloured the undulating race of 190 kilometres. A moment’s hesitation gave Cancellara enough to succeed. Former world champ and Flanders winner Ballan, Roubaix winner Johan Van Summeren and Vuelta a España winner Vincenzo Nibali were all left behind. Iglinsky, winner two years ago, took second at 42 seconds back. What is worrying for riders like Philippe Gilbert, or even Mark Cavendish watching at home, is that the last time Cancellara won Strade Bianche he continued in a similar vein in Tirreno-Adriatico and Milan-San Remo. The Tirreno-Adriatico stage race starts on Wednesday and ends on Tuesday, four days before San Remo. The others have been warned, Cancellara is in form. His team-mate Ben Hermans rode clear for much of the first half of Strade Bianche in an escape group of 12 riders. 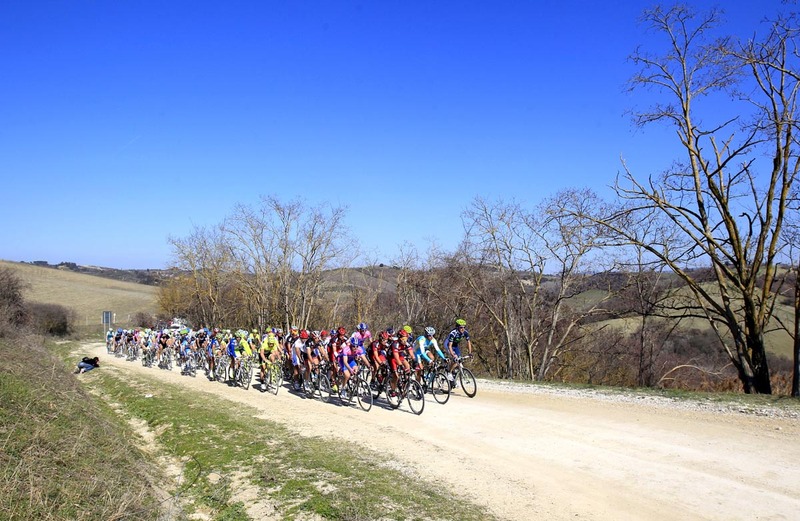 It formed 18 kilometres after the start in Gaiole in Chianti. The best known rider in the group was Marco Pinotti, BMC Racing team-mate of defending champion, Philippe Gilbert. By sector four, only nine riders pushed on with 1-36 minutes on the peloton. Garmin and BMC did most of the chasing. In the hardest sector, number five at 11.5 kilometres long, the main group caught the escape and reset the race for the final run to Siena. Flanders winners Cancellara and Ballan joined the front escape and re-shaped. The 19-man group included Van Summeren (Garmin-Barracuda), Nibali and team-mate Daniel Oss (Liquigas-Cannondale), Ballan and Van Avermaet (BMC Racing), Iglinsky and team-mate Roman Kreuziger (Astana), and Cancellara’s team-mate Daniele Bennati. Bennati is from Arezzo, just north of Siena and near the strade biache roads that cross Tuscany and Umbria. He attacked with Oss with 39 kilometres to race and went solo at 32.5. By the sixth sector, 25.5km to race, he had 42 seconds on the group of 18. Ballan and Van Summeren worked hard to come to grips with Bennati’s move. They shredded their group on the 15% climb in sector seven. They had Bennati back by the last sector, number eight, and with 17 kilometres to race. Van Avermaet surged in the sector, just a head of a climb, and pulled out the race winner. Cancellara and Ballan chased and moments later, with 12 kilometres to race, Cancellara rode free. The Swiss Champion had 18 seconds with nine kilometres remaining and Siena’s centre visible on the hilltop. Van Avermaet, Kreuziger, Iglinsky, Ballan and Gatto gave chase, but it was in vain. On the last ramps of 16% into Siena’s Piazza del Campo, Cancellara had 1-05 minutes over the five chasers.